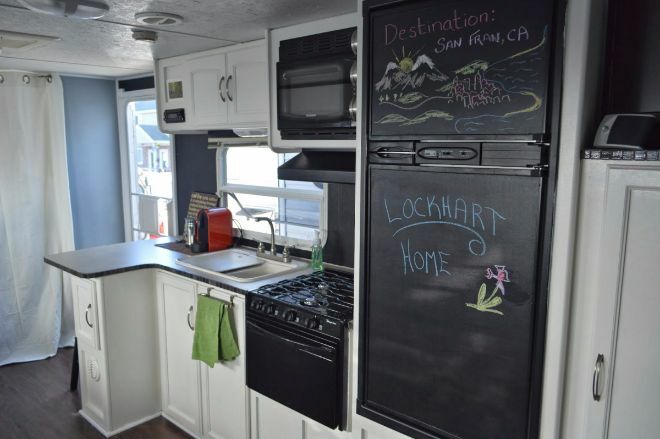 Open concept homes are all the rage nowadays, and the trend is finally reaching trailers. 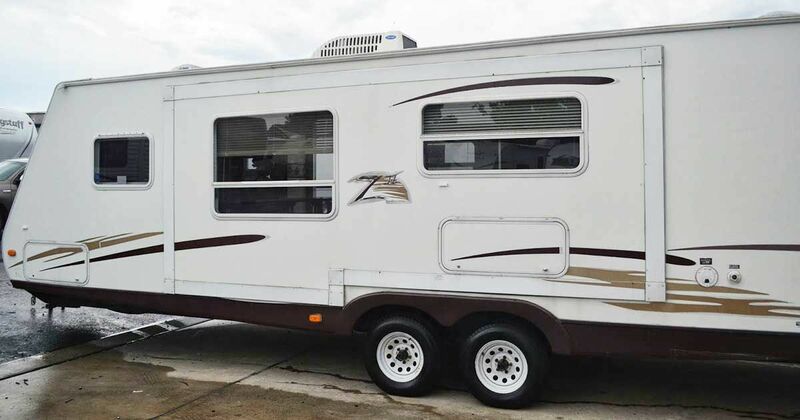 Even though trailers are much smaller in scale than regular homes, they're often compartmentalized with bedrooms, tucked away dining areas, and built in living rooms. 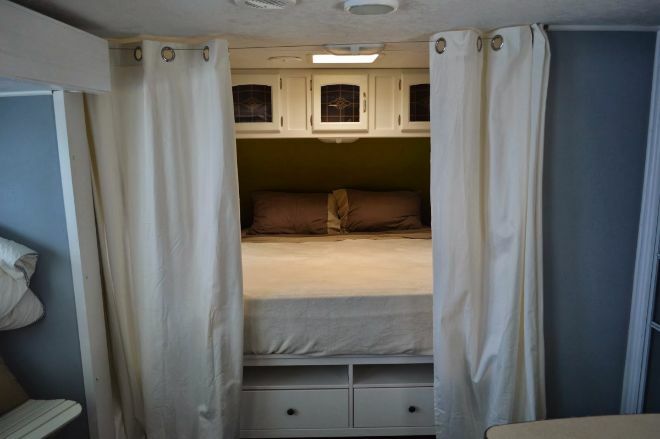 But the renovators of this travel trailer decided to gut it, and do something different. This trailer is not only light and bright with modern finishes, it has an open kitchen and a living and eating area that's up on a platform to create the illusion of more space. Plus, both bedrooms are wide open to the living areas which really opens this space right up. You have to check this out for yourself. This trailer looks like any other from the outside - but inside it's been renovated into a modern open concept space. 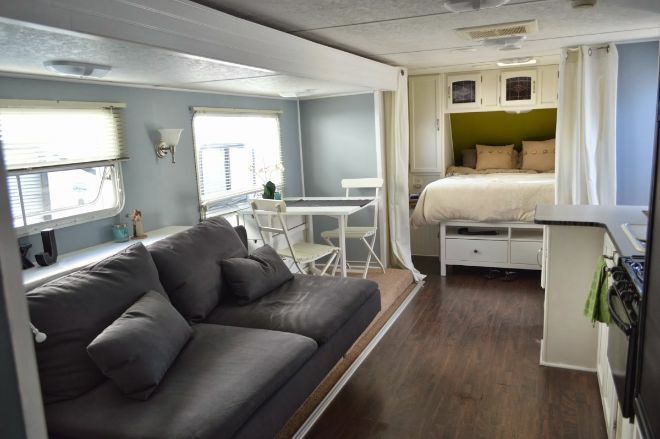 The trailer is this wonderful open concept space with light, bright color and modern touches. 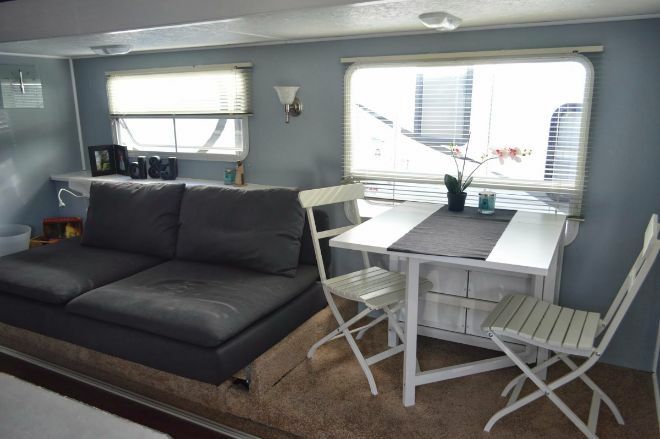 We love how the couch and eating area are propped up onto a platform, and the dark wood floors that run the length of the trailer. We also think it's really unique how the bed is open to the rest of the room. It really opens this entire space up. Having the couch and eating area up on their own platform gives the room a visual boost by making it seem more airy. We also love the neutral color combination because it keeps the tight space clean, and simple. Plus, look at those windows! They let in great light that opens this space right up. With a fresh coat of paint, and a bit of elbow grease, this kitchen looks brand new. The crisp white cabinets keep this space feeling open, and the contrast of the black appliances looks great. The master bedroom may be open to the rest of the space, but you can easily pull back the curtains for some privacy. The bedroom is also packed with extra storage space below and over the bed that looks great, and is totally functional. Finally, the twin bedroom. 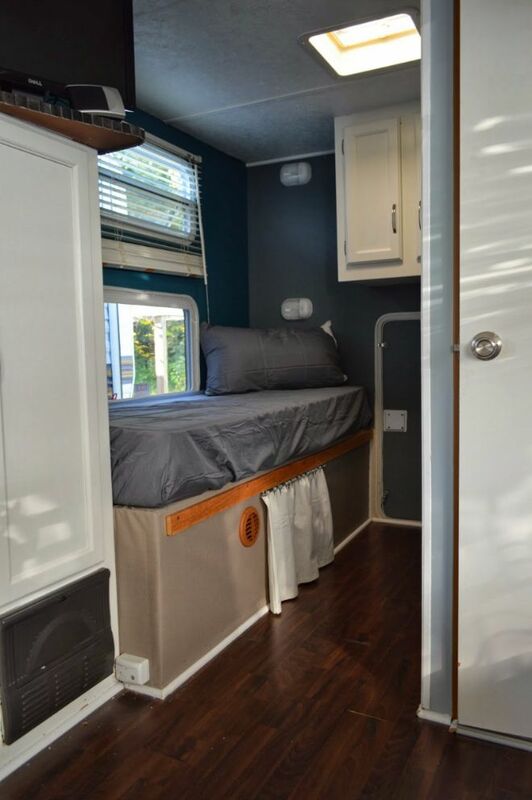 Tucked away in its own back corner, this little room really helps maximize all the space this trailer has to offer. Under the bed is ventilation and other necessities, but luckily a bed fits right on top making this the perfect space-saving solution. Do you adore this renovation? SHARE it with your friends on Facebook, Twitter, and Pinterest.